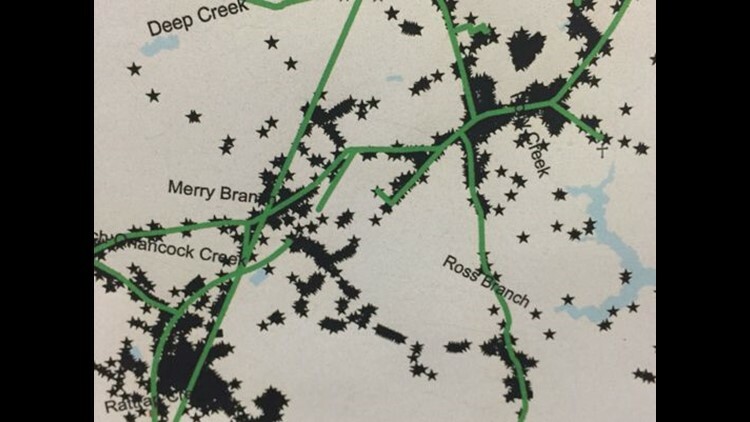 A map showing evert 911 address and fiber laid by Eastern Shore Broadband Authority was displayed during town hall meetings in Melfa and Eastville, Virginia on July 18 and 19, 2017. "That will give us access to approximately 25 percent of the homes on the Eastern Shore, which is a pretty large endeavor for us, ...But we realize we also need to do more, so our next step is ... the broadband authority is looking to expand our footprint." EASTERN SHORE, VIRGINIA (DELMARVANOW) — The Eastern Shore of Virginia Broadband Authority announced it plans to expand its residential, fiber-to-the home service to another 11,000 homes. The authority has applied to the Virginia Resources Authority for a $5 million, 10-year bond to help pay for the expansion, Executive Director Robert Bridgham told the Accomack County Board of Supervisors. Other financing options also are being explored, Bridgham said. The latest areas to get access to residential services through the broadband authority include Oyster and Nassawadox. In addition to the areas that already have access, residential service should be available by the end of this year through the authority in Exmore, Belle Haven, Cheriton, Wachapreague, Onancock, Cape Charles, Parksley and Nocks Landing, Bridgham said. "That will give us access to approximately 25 percent of the homes on the Eastern Shore, which is a pretty large endeavor for us," he said, adding, "...But we realize we also need to do more, so our next step is ... the broadband authority is looking to expand our footprint." The expansion, once completed, will mean the authority's network will provide broadband access to almost 70 percent of homes on the Eastern Shore of Virginia by 2021, according to Bridgham. All planned construction should be completed by the first quarter of 2021, and some areas should have service available by the second quarter of 2019, he said. The plan is to build out infrastructure in every incorporated town on the Eastern Shore, including Tangier, which will add access for around 7,900 homes in all. Additionally, the authority plans to add access to another 3,100 or so homes by expanding its footprint outside of towns, including reaching more areas on the Shore's many necks and adding a redundant path as a backup to the fiber backbone that runs along the railroad, down the center of the peninsula. "We do provide critical services to 911 and to the counties and such; we feel this is critical for the safety and security of the Shore," Bridgham said about the redundant path. The plan, in addition to the $5 million in debt, will require the authority to use some of its capital reserves, Bridgham said. Access to broadband service "is a necessity for a strong economy," said Robert Crockett, Accomack County Board of Supervisors chairman. "It looks like a great plan ... and we are in full support of it," Crockett said. If the Virginia Resources Authority (VRA) is the source of the funding, it may ask Accomack and Northampton counties for a support agreement that will obligate each county for a portion of the broadband authority's debt in case of default, Bridgham said. The VRA will require local approvals and any resolutions of support by Sept. 21, he said. The broadband authority to date has constructed around 300 miles of fiber and also provides public WiFi hotspots at locations up and down the Virginia Shore. It provides services to most of the governmental, educational and commercial organizations on the Shore. The authority in September 2016 embarked on its residential, fiber-to-the-home program. The first residential customer was connected in December that year.